Sketchbook is a section of Bob Glover.com. It starts out with pages from a sketchbook and some loose sketches from the time time when he was a student. 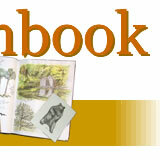 Notice that there are arrows for moving back and forth through the webpages of Sketchbook. Included in this section are finished drawings and paintings referred to as studies (for example). 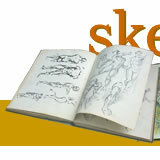 Several of the links to notes on works exhibited in the main gallery (Gallery 1) are to these sketchbook pages. I worked for 30 years in a business that had nothing to do with art but fortunately traveled to places where I was able to visit museums and galleries in my spare time. I carried along a sketchbook for making notes and studies. A newspaper article by Alice Eachus (Smoke Signals, June 2007) explains more about my sketchbooks. * The page header at the entry to Bob Glover.com is separated into links to different points of interest in the website. CLICK HERE to see an exploded view and learn more about them. I understand that when one artist studies closely the works of another its proper to give acknowledgement by flipping the copyright symbol. That's what I show in the detail to the left. 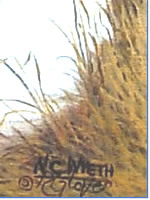 I placed the backward "c" between my copy of the N. C. Wyeth signature and my own to acknowledge that I study his work.